In my previous post, No Such Thing as Junk Miles, I wrote about how a lot of road bikes today are overly influenced by racing -- making them too narrowly focused for the needs of many people who otherwisecould be well served by a good-quality road bike, but instead get steered into mountain bikes, "comfort" bikes, and cruisers because they don't want something that essentially boils down to a racing bike. There are exceptions, of course, and I thought I'd highlight a few bikes available today, to fit a range of budgets, that buck the current trends in bicycle design by being simple, comfortable, and versatile. 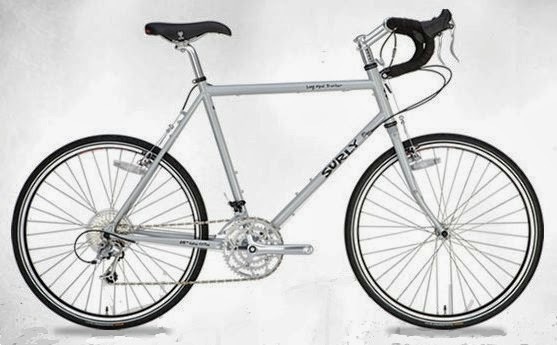 Surly Bikes, a brand from Quality Bicycle Products (QBP -- which supplies many bike shops around the country), offers a couple of bikes that fit my description of versatile road bikes. They also are pretty affordable. Using chrome-moly frames, welded construction, and single-color powder coated finishes, they are not particularly fancy, but should prove to be durable and enjoyable. The Pacer is Surly's answer to the question "Why can't I just find a sporty, no-nonsense, comfortable road bike?" Something like this would be a good choice for someone who wants a nice road bike for spirited riding -- but who isn't trying to be the next big thing in Cat 5 racing. Then again, it's about as racy as a lot of high-end racing bikes from my youth. The folks at Surly say it's a bike for "all-day rides" and it will fit tires up to 32 mm, which is a nice thing. Tires make a huge difference in comfort. It has eyelets so one could add fenders (though I'm guessing it would only take 28 mm tires with fenders). Available as a complete bike, or as a frame set for a truly customized set-up. I've seen Pacer frame sets sell for around $500 - $550, and complete bikes about $1400. Also from Surly is their Long Haul Trucker. This bike would be a great choice for long distance, loaded touring, commuting, and more. With slightly heavier-gauge tubing, it should handle heavy loads and anything else a person can throw at it as well. It can accept fenders and racks of all kinds and configurations. One particularly interesting thing about the LHT is that in many frame sizes, it can be ordered in either a 26" wheel or a 700c wheel version. (26" available from 42 to 62 cm frame, 700c available from 56 to 64 cm.). Considering that an awful lot of people out there ride mountain bikes that never leave the pavement, I really think that many people who might think they need a mountain bike would probably be suited just fine with a 26" wheeled LHT. 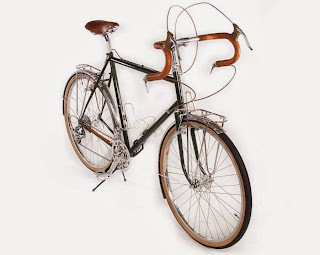 Like the Pacer, it can be purchased as a complete bike, or as a frameset, which gives a person lots of options for tailoring the bike to their own specific needs. Equip it as modern or as "Retro-grouchy" as you like. Complete LHTs seem to average around $1300, while frame sets are likely to be found for $450 - $500. with a lot of V-O branded components. Velo-Orange offers several models of nice road bike frames for buyers on a reasonable budget. Their Polyvalent and Campeur frame sets are both welded with butted chrome-moly tubing and painted in single-color paint jobs with tasteful, understated graphics. The Velo-Orange designs tend to have a classic French flavor, being influenced by great French road/touring bikes of a golden age. According to the V-O description, the Polyvalent Mk II (French for "general purpose") is designed for "cyclo-touring, brevets, and fast club rides." It is designed for 650b wheels (a size about half-way between 26" and 700c) which is a size that was often used on those golden-age French touring, or Randonneuring bikes. The Polyvalent is only available in four sizes, between 51 - 60 cm, which means very short or very tall riders may need to look to one of the other models. The Campeur frame is designed to be a very versatile bike, capable of loaded touring, or riding on pavement or path. It is designed for 700c wheels, and is available in sizes from 51 - 63 cm. 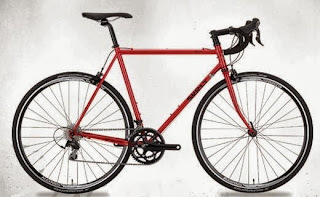 Both bikes can be built up in a variety of configurations to suit many types of riding styles, and Velo-Orange can supply most of the parts needed to complete the bike (V-O has a full line of classic and traditional styled parts and accessories -- many with their own brand name). Some new, or newly re-designed models are in the works at V-O, like the Pass Hunter, and Camargue, and should be worth checking out once they're available. Current frame sets sell for about $500. To many, the ingredients for New York City’s bike-share program suggested a sort of sadistic alchemy. Start with notoriously unforgiving traffic. Add thousands of bicycles along the city’s most congested corridors. And see how perhaps the world’s least understanding drivers would cope with the new additions. And one more thing: Many of the cyclists would be helmetless novices — or worse, tourists — careening into and out of lanes with the whimsy of a youngster pedaling through a suburb. As of Monday, though, after more than five months and five million trips, none of the program’s riders have been killed on the bikes. About two dozen injuries, most of them minor, have been reported. The stealthiest silent alarm for bikes. When someone as much as touches your bikes, you'll get an instant (as in one tenth of a second instant) notification in your smart phone. If the worst happens and your bike are stolen, Cricket can hunt down your bikes using it's cloud based system to ensure a swift recovery. Your first line of defense - a small, lightweight silent alarm for your bikes. When combined with our free iPhone app, it allows you to sit back, enjoy and know your beloved bikes are safe where you left them. The Cricket uses low-power Bluetooth communications with a range of up to 150 feet and works for years without replacing the battery or switching the device on/off. Each year hundreds of thousands of bikes are stolen across the United States, and each theft leaves the victim stressed and upset on top of their financial loss, we're here to help. You simply attach the cricket to your bikes, underneath the seat for instance and download the free app. That's it, from now on, all you have to do is activate the cricket on your mobile phone. Battery Life: At least a year, usually years. Device Compatibility: iPhone 4S, iPhone 5, iPhone 5S, iPhone 5C, iPad 3rd and 4th gen, iPad mini, and iPod Touch 5th gen. The Cricket has a range of up to 150ft. The application contains a bar showing you the Cricket signal reception, and will also notify you once you get too far. It’s 30mm wide and 9mm thick (1.2 by 0.35 Inch). But if more people join in, size might be smaller. The Cricket uses an easily replaceable CR2032 coin cell battery. Thanks to the new Bluetooth Low Energy technology and a smart power saving algorithm, this battery lasts at least for a year ! The Cricket works with iPhone 4S, iPhone 5, iPhone 5S, iPhone 5C, iPad 3rd and 4th gen, iPad mini, and iPod Touch 5th gen.
We looovvve Androids. Unfortunately, Android’s current support for Bluetooth 4.0 is limited, once there is a bugless solution for using Bluetooth 4.0 on Android, we will build an Android app. Trust us, it will be high on our task list. In the meanwhile, please join our mailing list at www.b45h.com – so you’ll know once we start supporting Androids. Via the supplied zip tie or Velcro strip. The Cricket will work best underneath your seat. It is advisable not to attach the Cricket to metal objects such as your bike frame. You can play with different locations and check for signal strength in the app. How long will the Cricket last? At least a year, usually a lot more, depending on how much you use it. We will ship the Cricket before spring. The Cricket is as close as you can get to the ultimate solution without having to sleep with your bike under your pillow. The Cricket works best at close, over the shoulder distances. People will touch your bike by mistake from time to time, so it is best to use the Cricket when taking a look at your bikes is as easy as looking over your shoulder. However, if your bikes are gone missing while you are not next to them, the Cricket will become a beacon, notifying you instantly once anyone with the Cricket app is at close range to your stolen bikes. We recommend installing the Cricket in a less visible location, such as underneath your bike's seat. We also supply the Cricket with a plastic zip lock, which should make it harder to just grab your Cricket. And don’t forget, the second someone as much as touches your bikes or just starts playing with the Cricket, your app will notify you instantly. For added protection, we also offer the Cricket embedded within a U-Lock. Who made your video ? Hoohah Creative Collective from Israel. You can contact them at orensteinelad@gmail.com, we love these guys. Which bike brand are you using in your video and images ? We are mostly using Pitango Bikes http://www.pitangobikes.com go check them out ! Shipping is free, worldwide ! What's been done already ? We've received a few price quotes from manufacturers, and are ready to make the next move - ordering a large batch of Crickets. We've also build our iPhone version of the software. 'seoul cycle design 2010', organized in collaboration with seoul design foundation. the tire design features heart-shaped knobs that create playful tracks on the streets. a series of corresponding bike racks are distributed throughout the city. Looking back through the blog posts I have made I can track a definite progression of my movement away from mass participation events toward more low key, intimate events. I guess this is mainly as these smaller events tend to be the most challenging. The tougher you make something, the fewer the number of people who are gonna show to suffer. So, finding myself on a start line with less than 200 riders around me didn't feel out of place. But the fact that about 5000 had already started the event ahead of me that morning was mind blowing. Plus, another 6000 or so would be starting over the course of the morning…even more mind blowing! Racing bikes affords me not only the opportunity to suffer with friends new and old, but also to fulfill my passion for travel. Nothing gets you more ingrained in a new place than being absorbed into a bicycle event. If you love the outdoors then at some point you will of been alerted to the huge potential Norway offers, a nation of outdoor sport lovers over all seasons. Norway has a lot to offer. When I was contacted by Singletrack Magazine about a “gravel” race in Norway I was instantly keen to know more. When I found out there was the opportunity to travel with a photographer to cover the event I agreed to do it. Then, when I found out it was the largest mountain bike race in the world with an entry field of 17,000 I was stunned. 17,000 riders! The Birkebeiner bike race is truly massive! The event is a 94km race from Rena to Lillehammer using the network of gravel roads. The trip started on the Thursday before the race with meeting my travelling companion, photographer Henry Iddon, and two hours of wrangling with check-in at the airport due to some confusion over the ticket booking (I had at the last minute replaced another traveler). Having not met Henry previously, we quickly eased into conversation with a mutual love for cycling, travel and general misadventure. Perfect tyre pressure for cyclocross is a personal thing, with variables in riding style, experience, setup and conditions all affecting the ideal arrangement. Correct pressure should be low enough to provide maximum tyre contact area and shock absorption without bottoming out on the rim. So what PSI is that, exactly? You will have to experiment to discover what works best for you. Here's how. The first step to unraveling this mystery is to establish benchmarks. Either get a good gauge (more on that later) or at least commit to using the same pump all the time, as different pumps can have wildly varying readouts. Now, start at a fixed point, say 50psi if you’re new to ’cross and using clincher tyres. 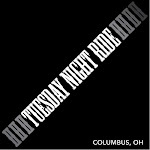 Next, make some notes as you ride and race. Then, adjust the pressure according to the points below — and keep track of the exact pressure and the results. Pinch flat during a training session? Add some pressure. Feel like you’re getting rattled around like a pinball? Let a little out. But above all, keep track of what you’re doing and how it works. It might sound complicated, but it doesn’t take long to accumulate some experience and build a good data set. It's important to remember that what works well for one rider might not be best for another. Upcycled shopper pannier made with salvaged materials - perfect for that trip down to the farmer's market. Each bag is uniquely cropped from our limited stock of banners & truck tarps. Trim colors are selected to complement the graphics. The Biking Game is a multi-generational game that allows every member of the family to play together. 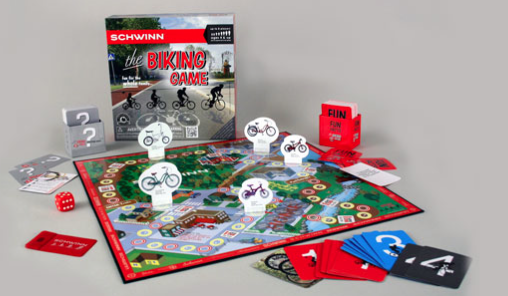 Themed around the legacy of biking with one of the more iconic biking companies on the planet, Schwinn, the Biking Game promotes an active lifestyle while educating and inspiring a future generation of bikers. The Biking Game was created to inspire families and bike enthusiasts to get outside and enjoy one of America’s greatest recreational activities together. The game is designed to grow with the player, starting at level one questions, which are primarily identification of basic bike parts and riding etiquette. As the players increase in their knowledge about biking culture they grow into the higher level questions. A fun & educational game where parents & children can race to see who can get their bike through multiple terrain and back home first. All while sharing favorite biking memories and creating new ones!